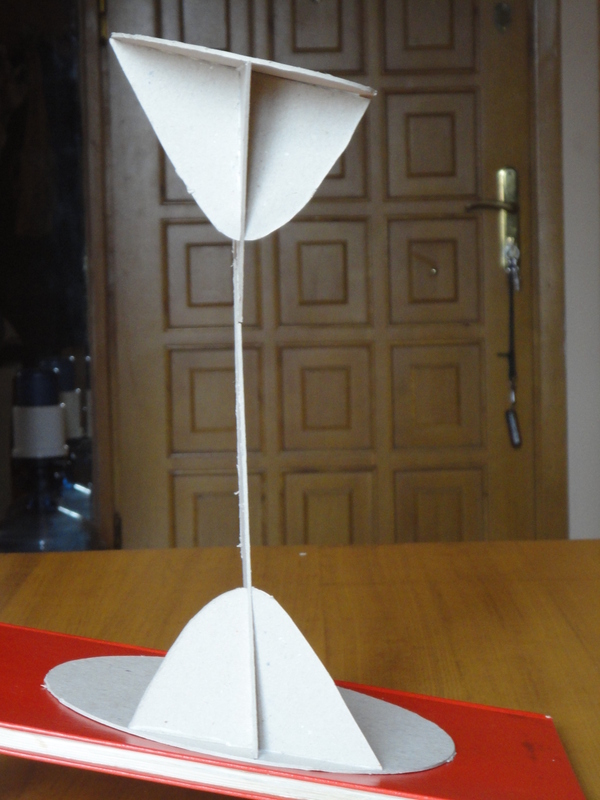 Here is the model that I made of the hyperbola, or rather the conjugate hyperbolae, as Apollonius calls them. The hyperbolae are the curved figures that are seen head on, parallel to the plane of the screen. More precisely, the hyperbolae are the curved boundaries of these figures. But the hyperbolae as such can be extended indefinitely; in the picture, they are cut off by certain straight lines. I refer to these straight lines as chords of the hyperbolae, although Apollonius has no special term, even though “chord” does come to us from Greek χορδή (it means gut). The vertical line in the picture is the diameter of the hyperbolae, and it intersects the hyperbolae themselves at their vertices. 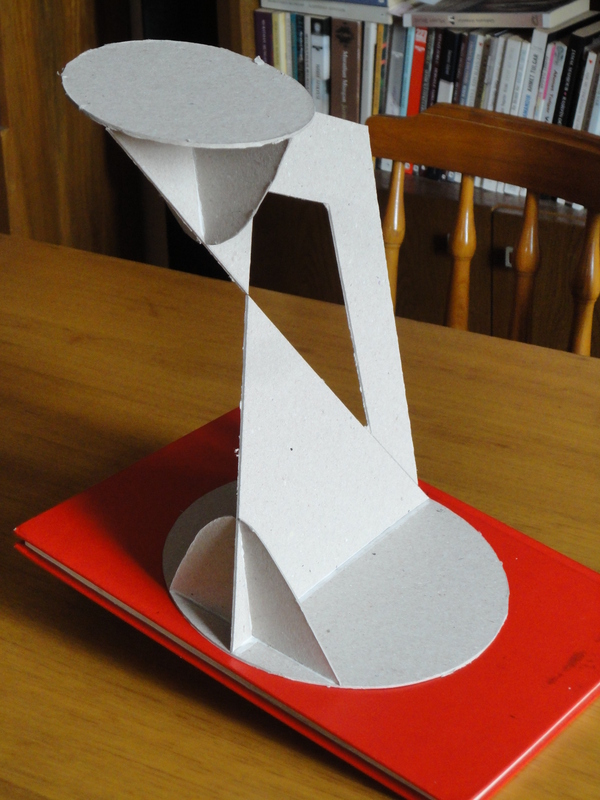 Unfortunately the cardboard diameter in the model lists to the right; it should be perfectly straight. The chords that cut the hyperbolae in the picture are supposed to be parallel and equal to one another. Then the chords cut off equal segments of the diameters, as measured from the respective vertices. The diameter bisects the two chords, as well as any other chord drawn parallel to them: this is why the diameter is so called. In particular, if through the vertices we draw parallels to the chords, then these parallels should be tangent to the hyperbolae. Unfortunately this does not quite appear to be the case in the model. The segment of the diameter that lies between the two vertices is the tranverse side of the hyperbolae. Apollonius shows that every straight line drawn through the center of the transverse side is a diameter of the two hyperbolae, provided it actually intersects them. I am not going to work out that theorem here; I shall just note that the “analytic” methods of Descartes are not very good for proving it. Descartes reduces geometry to equations involving lengths. The methods of Apollonius involve areas as well. One can reduce an area to a product of lengths; but I do not think this is actually helpful for the theorems of Apollonius. However, as I said, I shall not take this matter further here. I just want to work out the equation of the hyperbola from looking at the model. Turning the model shows that the two conjugate hyperbolae do not sit symmetrically in their respective cones. Of course this means we have to prove the claims above about the symmetry of the hyperbolae themselves. The two triangles in the picture are axial triangles: they contain the centers of the circular bases of the two cones, and they contain the common vertex of the cones. The axial triangles need not be isosceles, and they are not isosceles in the model. 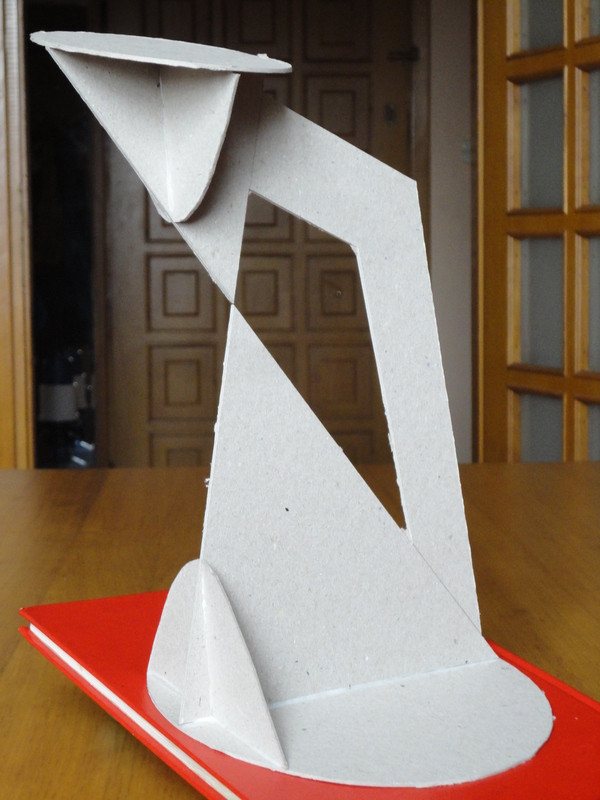 The cardboard strut in the model is probably not the best way to hold the axial triangles together. 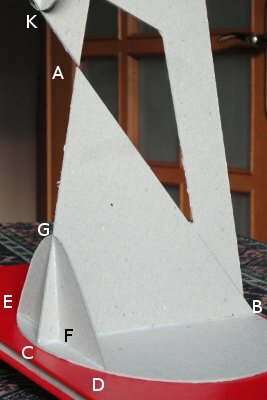 The strut is not strong enough to keep the two triangles in the same plane unless that plane is vertical; and holding the plane vertical requires tilting the bases of the cones. A straight line drawn from one of the hyperbolae to the diameter, and drawn parallel to the tangent at either vertex, is an ordinate. The segment of the diameter that it cuts off, as measured from either vertex, is a corresponding abscissa. Thus two abscissas correspond to each ordinate: this is a departure from the usual sense of the term, in which only the shorter of these two segments is the abscissa. But now we can say that the square on the ordinate varies as the rectangle bounded by the abscissas. Indeed, in the figure, DF is an ordinate, with corresponding abscissae FG and FK. In particular, the points F, G, and K lie on a straight line, although there is no cardboard in the picture between G and K. The square on DF is equal to the rectangle with sides BF and FC, and these sides vary as FK and FG respectively (that is, they so vary as the plane containing BC moves up and down, remaining parallel to itself). x2 = ay (t + y). x2 = (ℓ + ℓ⁄t ⋅ y) y. Thus the square on the ordinate is equal to a rectangle on the abscissa whose height exceeds the upright side, the excess being to the abscissa as the upright side is to the transverse side. This entry was written by David Pierce, posted on October 10, 2014 at 3:50 pm, filed under Conic Sections, Education, History, Mathematics and tagged 2014, Apollonius, hyperbola. Bookmark the permalink. Follow any comments here with the RSS feed for this post. Post a comment or leave a trackback: Trackback URL. For real? Look at the Ear folds and Collar!